We couldn’t possibly write a column about the flavors of fall without talking pumpkin. And man alive, did we ever have a harvest bounty of pumpkin options to choose from. 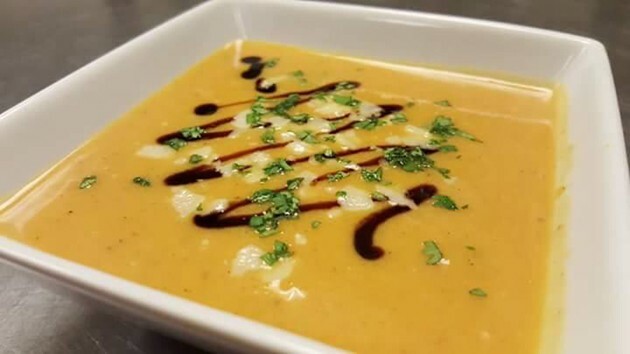 We made the excellent choice of stopping by Sapori Cafe for their house made, seasonal Roasted Pumpkin Soup with fig balsamic drizzle and grated asiago cheese. Sapori Cafe is making a name for itself with its seasonal soups, sandwiches and desserts, as well as their extensive catering menu. 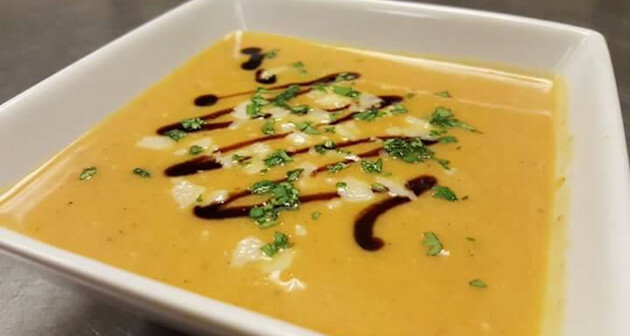 The Roasted Pumpkin Soup is an excellent example of Chef Joe Gianvecchio’s commitment to quality and to detail – and to scratch making some really fantastic food. You won’t find canned pumpkin in this soup. Chef Joe is roasting fresh, local pumpkins whole and pureeing them to create a dish that manages to be both satisfying and hearty without being overwhelmingly rich. That’s largely thanks to its chicken stock base, a departure from the heavy, cream based root vegetable soups we’re accustomed to seeing. The roasted pumpkin and chicken stock are gently blended with brown sugar, cinnamon, nutmeg, garlic and lastly, sherry wine, the magic ingredient that’s waking up the flavors of this soup and giving it a level of interest uncommon to this familiar dish. I adored the soup itself, but as he so often does, Chef Joe outdid himself by topping the soup with a tangy, sweet balsamic fig drizzle full of harvest flavor, and a grate of fresh asiago cheese. Layers of flavor and texture, and a salty, nutty bite from the cheese made this soup unequivocally a Best Dish.